Renhold United chalked up their fifth league win on the bounce on Saturday to go three points clear in the Premier Division supported by Sportsform. They enjoyed a 3-1 home victory over Ickwell & Old Warden. Jason Allison, twice, plus Mark Reed netted for the league leaders against one in reply from Ickwell’s Ricky Aris. Meanwhile second placed AFC Oakley M&DH were held to a 2-2 draw at home to Ampthill Town Reserves. Their scorers were Alex Liburd and Shaun Barnett against a Town brace in reply from Phil Matthews. For third place Wilstead it was a 4-1 home victory over Pavenham. Ahead in the 13th minute via JM Steele the visitors were to draw level when James Owen struck three minutes into the second half. Alas their lead lasted just eight minutes before Paul Jones restored Wilstead’s advantage which was increased by brother Michael in the 77th minute and Stuart Robson in time added on. Following two straight home defeats fourth place AFC Kempston Town & Bedford College went someway to repair the damage by beating Caldecote 5-1. Mike Stephenson scored twice alongside single strikes from Courtney Boughton, Matt Cheveralls and Aaron Chaplin to bring up the nap hand against a lone reply from Tom Wallace who then got himself sent off. Whilst fifth place Flitwick Town took their revenge on Cranfield United for last weekend’s Britannia Cup defeat by beating them 2-1 at the Football Centre to end United’s six game winning league run. Nick Atkins and Jack Brereton were on the Town’s scoresheet against a lone United reply from Jack Brown. Elsewhere bottom of the table Elstow Abbey have now lost their last nine home games after going down 7-0 to Shefford Town & Campton in a game that saw both sides end the day with just 10 players. Andrew Hayday scored five times to go alongside single strikes from Adam Larsen and Jamie Osbourne who with just 15 minutes showing on the clock was red carded to leave his side one player down until Abbey’s Emmanuel Obuduechine evened things up a minute from time. The Marston Shelton Rovers v Eastcotts AFC was postponed due to the state of the pitch at Weston Park. With AFC Oakley M&DH Reserves unable to raise a side to visit Sundon Park Rangers the three points thus duly granted to the Rangers sees them eight points clear at the head of the Division One supported by Wests Citroen Bedford league table. Second place Stevington had to postpone their home encounter with Meltis Albion due to the unfit state of their Playing Fields pitch. Whilst Ickleford failed to grab their chance to move up into the top three when held to a 0-0 draw at Riseley Sports. Elsewhere the biggest winners of the day were Henlow who netted their third home win on the bounce with a 5-1 victory over second from bottom of the table Houghton Athletic. Antony Bowskill led the way with a hat-trick and he was supported by single goals from Russell Ayles and Jonathan Whitehead to bring up the nap hand against a lone reply from Jordan Thomas. Meantime Shefford Town & Campton Reserves are now unbeaten in their last four league outings following their 2-1 home win over Westoning. Sam Child put the visitors in front before Sam Kelly levelled matters five minutes before the break and then hit the winning goal 10 minutes from time. This season’s final at The Hollow, home of Potton United, on Friday, April 1 will be a Cople & Bedford SA v Kempston Hammers Sports affair after both sides emerged semi-final winners. The Hammers, via an own goal and a strike from Jimmy Grandidge, secured a 2-1 home win over Stevington Reserves whose reply came via Cameron Cain. 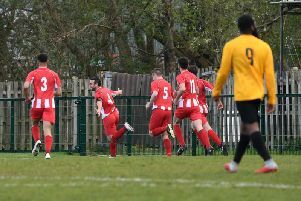 Whilst Cople & Bedford SA needed a 5-4 penalty shoot out win at Clapham Sports to earn their finals spot after 90 minutes play had seen the sides all square at 3-3. Liam Bolton, Marko Tobozic and Peter Bryant were on the home scoresheet against SA replies via Ollie Hughes, Brett Allen and James Munns. The lone league game of the day saw league leaders Cranfield United Reserves lose their season’s 100% away record when held to a 1-1 draw at now second place Atletico Europa. Tadji Janrovic were on the home scoresheet against the United reply from Elliott Forder. Dinamo Flitwick will now travel to Wixams next Saturday for a second round tie after they emerged 2-1 winners at Meltis Albion Reserves. Carl Terry and Scott Hannam were on their scoresheet against a lone Albion reply from Dudzaji Manomano. Also on the road next Saturday for a second round tie at Shefford Town & Campton A will be Caldecote A who required extra time to see off Flitwick Town A at Harvey Close after 90 minutes play had seen the sides deadlocked at 1-1. Jake Bruce was the home goalscorer and Kevin Higby the Town scorer inside normal time. Then Bruce completed his hat-trick and Jack Stagg plus Rhys Parker both added to the home scoreline in extra time, against a lone Town strike via Stuart Kelly, to bring us to a 5-2 scoreline at 120 minutes. The scheduled Westoning Reserves v Sandy Reserves game at Greenfield Road was waterlogged off. Polonia Bedford moved to within seven points of league leaders Mid Beds Tigers after winning 5-3 at third place Bedford Albion who they now head by five points. Adam Chlapinski with a brace was joined on the scoresheet by Filip Otocki, Dariusz Slowinski and Wojciech Plizga to bring up the nap hand against Albion replies via Jack Brown, Josh Emmerton and Paul Babbington.